State University of Malang (Universitas Negeri Malang), INDONESIA. Associate Professor, Department of Applied Foreign Language, Cheng-Shiu University; Professor, Center for Teacher Education, Cheng-Shiu University; Teacher, Kaohsiung Municipal Jhong-Jheng Senior High School, Kaohsiung; Principal, Kaohsiung Municipal Chung-Shan Senior High School, Kaohsiung, TAIWAN. Producer, Educational MultiMedia Research Centre, University of Mysore, Manasagangotri, Mysore, Karnataka; Assistant Professor, Department of Studies in Communication and Journalism, University of Mysore, Manasagangotri, Mysore, Karnataka, INDIA. Department of Communication, Bangalore University, Central College, Bangalore, Karnataka State, & Department of Studies in Communication and Journalism, University of Mysore, Manasagangotri, Mysore, Karnataka State, INDIA. School of Education and Modern Languages, CAS, Universiti Utara , MALAYSIA. Department of Educational Foundations, Great Zimbabwe University, Masvingo, ZIMBABWE. Faculty of Law, Brawijaya University, Malang, INDONESIA. Department of Educational Foundations, Robert Mugabe School of Education, Great Zimbabwe University, Masvingo; Mbizo Primary School, Luveve, Bulawayo, ZIMBABWE. Department of Curricula & Teaching Methods, Faculty of Education, Taibah University, Madina Munawarah, KINGDOM OF SAUDI ARABIA. 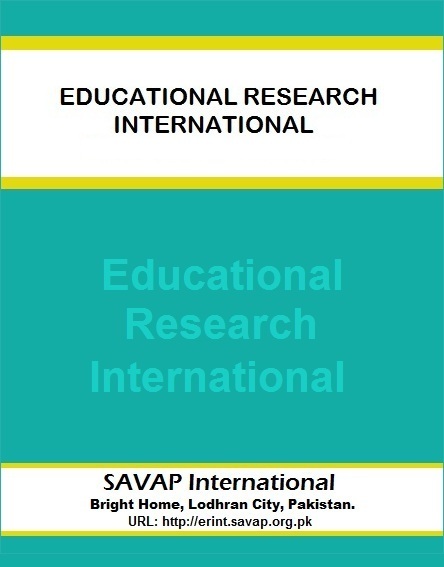 Copyright © 2013-2016 SAVAP International. All right reserved.